Dr. Gallentine graduated from Waynesburg University with a Bachelor's degree in Biology. He then attended Palmer College of Chiropractic in Davenport, IA. 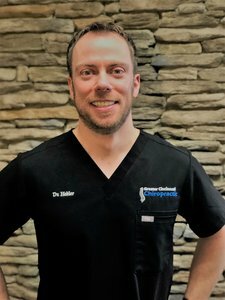 After graduating from Palmer in February 2013, he moved to the Cincinnati area and opened Greater Cincinnati Chiropractic. His mission was to help the greater Cincinnati area and has devoted his time in doing so ever since. Dr. Gallentine believes pain is inevitable but living and suffering with pain is an option. Dr. Gallentine views wellness from a holistic perspective. His concept of wellness consists of using Chiropractic as the foundation for wellness. With this foundation, he believes other aspects of health like nutrition, exercise, stretching, strength training and patient education can be incorporated into the Wellness model. He believes that to be well requires getting adjusted on a regular basis and having an optimal functioning spine and nervous system: This equates to optimal health. If the nervous system is not functioning as well as it could be, the body is in a state of "dis-ease." The absence of symptoms does not, therefore, equate to health. He believes that wellness is the optimal functioning of mind, body and spirit. 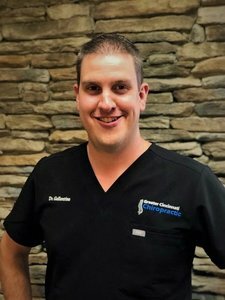 Dr. Gallentine’s goals also include educating the community on the benefits of chiropractic and how the body can heal itself, if allowed to function at its optimum capacity. We wants to help the Cincinnati community by enabling them to enjoy the benefits of chiropractic that He experiences on a daily basis, such as better health, lack of disease, life without medication, no allergies, a healthier life when he gets older, and the ability to exercise without concerns of pain. Dr. Gallentine wants everyone to have the freedom to live life. His desire is to change the concept of "sick care" to "health care." He wants people to view Chiropractic as part of a preventative, proactive lifestyle resulting in overall wellness. When I'm not in the office, you will find me spending time with my wife, family and friends and also my two black labs, Peaches and Piper. I enjoy being outdoors, salt-water fishing and hunting. I knew from an early age that I wanted to become a doctor and help people live happier, healthier lives. While pursuing that dream at Miami University and preparing to apply to medical school, I gained an even greater appreciation for the beautiful harmony that God created in the human body. All the parts of the body interact with each other, the food we eat, the air we breathe, the exercise we do (or don't do), and the thoughts in our head to produce either health or disease. The human body has inborn within it an amazing healing potential, and all we have to do sometimes is remove the interference to this potential and allow the body to heal itself. I started to see a chiropractor myself during this time. And as I asked a million questions, the light bulb came on and I knew I found my calling. My passion is to not only help people suffering from back pain, neck pain, headaches, etc. but also to help them reach their optimal health without the use of drugs or surgery. The entire family, from newborn babies to grandma and grandpa, can benefit from chiropractic care. After graduating from Miami University, I then attended Logan College of Chiropractic in St. Louis where I earned my Doctorate of Chiropractic. I moved back to my hometown of Cincinnati and have been practicing for over 10 years. When I am not in the office, you will find me spending time with my wife and son, outdoors with our two dogs, or rooting on my favorite sports teams. What inspired you to become a chiropractor? From an early age I always knew I wanted to become a doctor. What better way to make a living than to help people lead healthier, happier lives?! While in undergrad and preparing to apply to medical school, with all I was learning about how the human body works I realized that there had to be a better way. We were not born with a deficiency of Celebrex or Lipitor. The more I learned about chiropractic and how it focuses on the entire person and their lifestyle, I knew I had found my calling. There is no better feeling than helping patients reach their full health potential. If you could relive one day in your life what would it be and why? The day I married my beautiful wife, Lindsey. It was an amazing day filled with love, happiness, and family! What is the most valuable lesson you have learned in your life thus far? To live by the Golden Rule not only in my personal life but also in my professional life. I truly care about my patients' wellbeing, and give them the same level of attention and care as I would hope myself or my family would receive. What is your favorite place to eat in Cincinnati? My wife and I love the sushi at Kyoto. If you haven't tried it, I highly recommend it. We also really enjoy the food at Wildflower Cafe, which uses fresh and pure seasonal ingredients, purchased from local and organic farms. I've been with Greater Cincinnati Chiropractic since 2013 and part of my role is to make sure each patient has the best experience. The best part of my job is meeting the new patients either in office or at an event and watch their progression with chiropractic care. Many of our patients have never experienced chiropractic, have had a bad experience elsewhere, they do not want to have a surgery or they do not want to take a pill to mask their pain. I sincerely enjoy hearing about their stories and watching them get back to their life before pain. As far as my other responsibilities go, a joke at the office is I take on all tasks besides any adjustments! I enjoy my role and if I can assist a patient with anything to make their life simpler such as go over a complimentary insurance verification, assist with their appointment scheduling or etc. Favorite vacation spot? Jamaica - everything about this island is great from scenery, atmosphere, culture and I always leave feeling relaxed and recharged. I've visited Negril, Tower Isles and Ochos Rios and have found to enjoy Negril the best. One piece of advice, if you do decide to visit Jamaica - do not leave without trying Jerk Chicken. How would your co-workers best describe you? Energetic, friendly, caring and enjoys talking about her dogs. If you ever need to hear a funny story about dogs - I have quite a few to pass your time while on therapy at the office. Here at Greater Cincinnati Chiropractic, I am a Patient Care Coordinator. I assist with patient care ranging from starting patients on therapy, assist with front desk duties, checking out patients as well as reaching out to patients about their care. What is your favorite part about working at Greater Cincinnati Chiropractic? My favorite part about working at Greater Cincinnati Chiropractic is the welcoming and supportive staff. I also enjoy seeing the patients' progression on their care plan. It's amazing to see a patient come in with extreme pain suffering from whatever injury brought them into the office and then see their life change by mood improving, being able to get back to whatever they enjoyed before their injury. What is the top 3 things on your bucket list? 1: Visit as many places in my life as possible. 2: Marry my soulmate. 3: Sky Dive! As a Patient Care Coordinator with Greater Cincinnati Chiropractic it is my job to help patients feel comfortable the minute they walk through our doors assist them with therapy before they see one of our doctors. More about Brianna: Brianna is either spending time with her family or friends. She loves to take her pup Tucker on hikes or to the dog park. What is your favorite part of working at Greater Cincinnati Chiropractic? I've only been working here a short time and it already feels like a second family. If you could choose to do anything for a day what would it be? I could never pass up on nice beach day in Aruba! Aside from the necessities, what one thing could you not go a day without and why? Not Seeing or talking to my boyfriend & puppy Tucker.